As I mentioned in my previous post, SEO tactics for eCommerce category pages, optimising an eCommerce site can be a daunting undertaking. This is especially true if you command hundreds or even thousands of product pages. Getting it right, though, is imperative, as online is the fastest growing retail market in Europe and is set to grow to £156.67 billion by the end of 2015. This article aims to cover what you need to know to effectively manage the SEO your product pages. You may also find our ultimate checklist to optimising eCommerce websites useful. These are at the top of the list for one good reason – they often get overlooked, underused, or sometimes overused (in the stuff-every-keyword-you-possibly-can kind of overused). This is where SEO on your product pages starts; when potential buyers do a search in an engine like Google, the product page’s title tag and meta description are usually the first things they see. So you need a winning combination to earn their click. Make sure these are fewer than 60 characters, this way they’ll be displayed properly in search results. If your title tags are longer, they’ll likely get truncated and you could miss that valuable click. Think about the keywords your buyer will use to find the product. Include the name of the product, brands which are relevant and another USP. This could be your price, delivery, an additional service you provide or other element that, compared to competitors, adds extra reasons to click. Keep them under 155 characters. Again, any longer and you’ll suffer from truncation, so you won’t get your full message across to the potential buyer, missing that click through to your product page. This is another opportunity to expand on the title tag. Add something unique to that product: what do you offer that’s different to competitors selling the same product? How can you make it stand out? Expand on the USPs or support the title tag with other USPs. Make sure your URLs are nice and clean. Don’t include numbers, characters and anything unrelated to the product. Keep them short, sweet and leave out any unnecessary words such as “and”, “with” or similar phrases. It’s also important to make sure they’re free from categories. This will largely depend on the Content Management System (CMS) you employ and whether your product is listed in just one category. If you have the same product listed in multiple categories, the best solution is to leave product URLs independent from category listings. Most products come with options; colours, sizes and shapes to name just a few. If your CMS allows it, we recommend making sure these options are selectable within a single product. Many CMS’s include separate products for different variations of the same thing. So you may have a product for the blue version, another for the red version and one more for the green version. What you’re effectively doing is creating three versions of the same thing with nothing but changed words where the colour appears. Similar content like this won’t do much good for your SEO. Unless there is clear evidence and demand from keyword research tools to give you reason to do this, we recommend not. Everyone has product images. The thing is, yours should be better than anyone else’s. Don’t rely on the manufacturer’s images either – everyone is using them. Take your own product photos and concentrate on what your buyers want to see. Clothing should be from multiple angles, on and off a model. Selling Jewellery? Make sure your images cover all angles; on a finger, off, and on a clean background so all focus is on the product. Be creative, what features of the product are most important and therefore should be close-ups? Think about a zoom feature too. You can also be clever with social media here and include Pinterest pins so people can share your unique, attractive product images. The above image is from Firebox and you can see it includes video, images and close-ups of specific product parts. This is one of the biggest factors on your product page. So many retailers make mistakes with these and don’t maximise the opportunity product content offers. Here are some tips to help you make the most of yours. Never use manufacturer provided product descriptions. They’re boring and everyone else selling the product will be using them too. Create unique product descriptions that have character and get across your brand’s culture. Think about what features your customer is going to be interested in and talk about that. 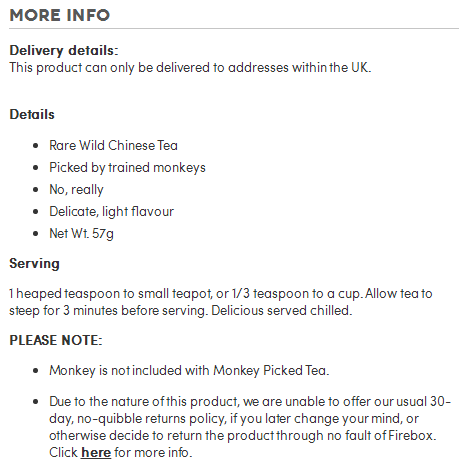 Here’s a brilliant example from Firebox and its Monkey Picked Tea (it’s surprisingly good). Include both descriptive, paragraphed text, as well as bullet points summarising all the features of the product. Again, expand it beyond (a) the manufacturer’s provided list and (b) what your competitors are providing. This will really help increase the value of your product page. Use bolded text, internal links and paragraphs. Make it interesting and enjoyable to read. 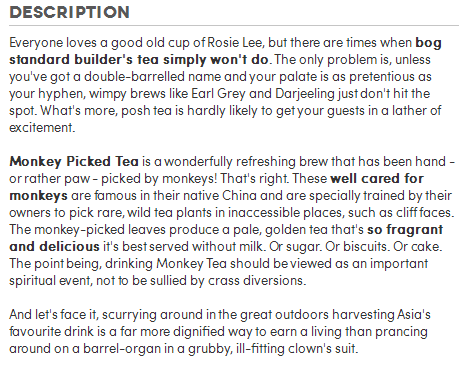 Here’s another example from Firebox’s Monkey Picked Tea. It even has serving instructions. Think about video. It isn’t hard to create a quick thirty second to two minute video of your product. Review it, explain what’s great about it, take it out and use it. Essentially, show it off. This will really help increase conversions, user engagement and help increase sales. Plus, the likelihood is that most of your competitors aren’t doing this. 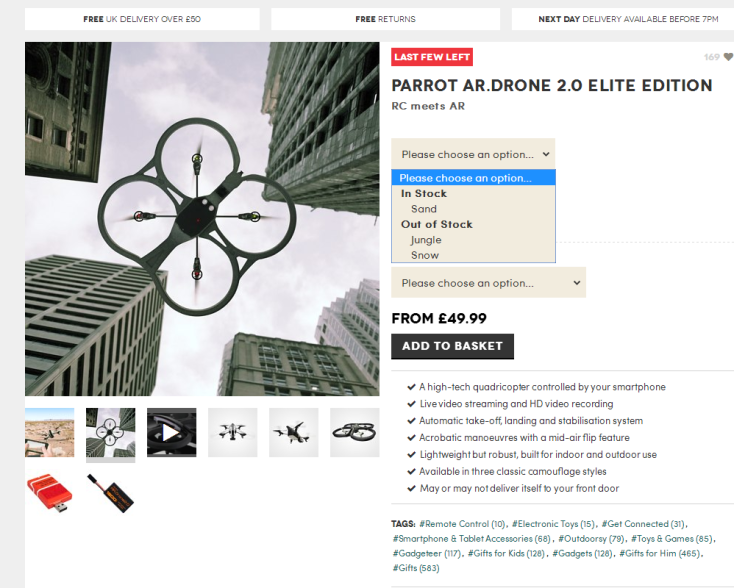 Within your product description remember you can link out to various other pieces of content. Perhaps you’ve done a series of blog posts about the product or related products? Add in links to these. Not all customers are going to buy on their first visit, so providing extra resources for them to engage with will reinforce trust and help foster brand loyalty at earlier stages of the buying cycle. Perform some keyword research to understand how potential buyers are searching for the product. Remember, the words you use to describe the item may not be the same as your customer. Think about synonyms, related phrases and the topic in general. Search engines (and users) pick-up on these themes. There are plenty of resources available; here are some of my favourites: io, Google Analytics, Google Search Console, Ubersuggest and the Google Keyword Tool. Trust signals are big deal. Recognisable brands, security images and, most importantly, a HTTPS connection are hugely important. Check that you have all these things in place as they will build trust among your potential customers. No one is going to commit their financial details to you without first trusting you. Your website and product pages have to do that for you. This might not sound like an SEO tip but it is. Make sure you perform competitor research. What are your competitors doing with their products? What content are they using? What keywords are they targeting and where? Compare the pages side by side and think from the perspective of ‘which would I buy from and why?’ without bias towards your own site. This may reveal some interesting things such as additional product information, some insight or angles you haven’t yet considered. Make sure you have a clear indicator of product information separate from the description. Is the product in stock? Is there a promotion or discount on? Is there a cross-sell promotion happening? Do you have a wish list feature to which they can add the product? This product page shows clear options, which colours are in stock and a warning about low stock. Delivery is one of the most important things to buyers. In a survey by eConsultancy, delivery costs were the reason for 70% of purchase abandonments. Make sure you provide accurate delivery information and costs for the buyer, so they know how much they’re going to be charged before committing. If you don’t then it’s likely you’ll suffer from high cart abandonment rates. These are hugely important, so make sure you encourage reviews and add product structured data to your product pages. This will really highlight your product in search with additional information including star ratings, offers, stock and price. It can help win you those valuable clicks from search result pages. Make sure people can share your eCommerce product page. Let your buyers and users do the promotional leg work for you. Include social media sharing buttons on the page as a call to action. Not everyone is going to buy on first visit, but they may share your product beforehand. Take advantage of this – having unique product images and content will really help increase the chances of users sharing the product. Wondering why people aren’t sharing your current product page? It’s probably because something about it looks just like the last website they visited. Do you know how many people use your website with a mobile device? If you don’t, use Google Analytics to find out how many are – otherwise you may be missing out on sales. From 2014 to 2015, sales via mobile devices grew by three per cent in the UK. That equates to over 26 per cent of sales in the UK being made online through mobile devices. 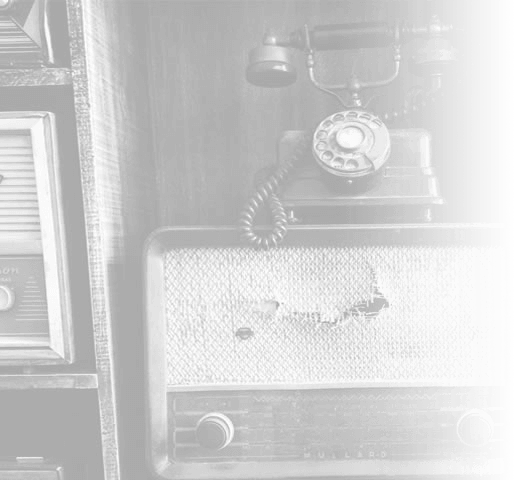 Your market is evolving; your site needs to keep up. 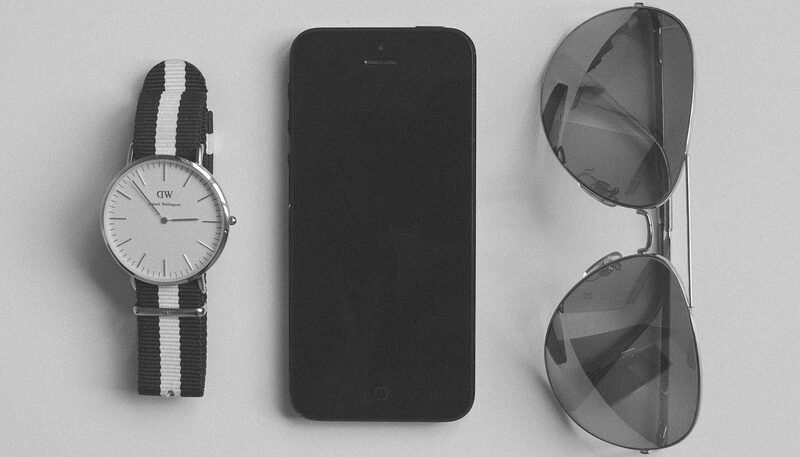 There are plenty of tools to test how well your website works on mobile. If you’ve not got an eCommerce site optimised for mobile, we recommend finding yourself a developer to build a responsive website and start claiming that revenue.